Changes // Plans // Happy Things - Sugar, Darling? Well an obvious one is that I'm finally living my dream of having grey hair! I've wanted it for so long but until recently I didn't have a hairdresser I trusted to do it, but now I've found Sean Garner and I can have the granny hair I've always wanted!!! 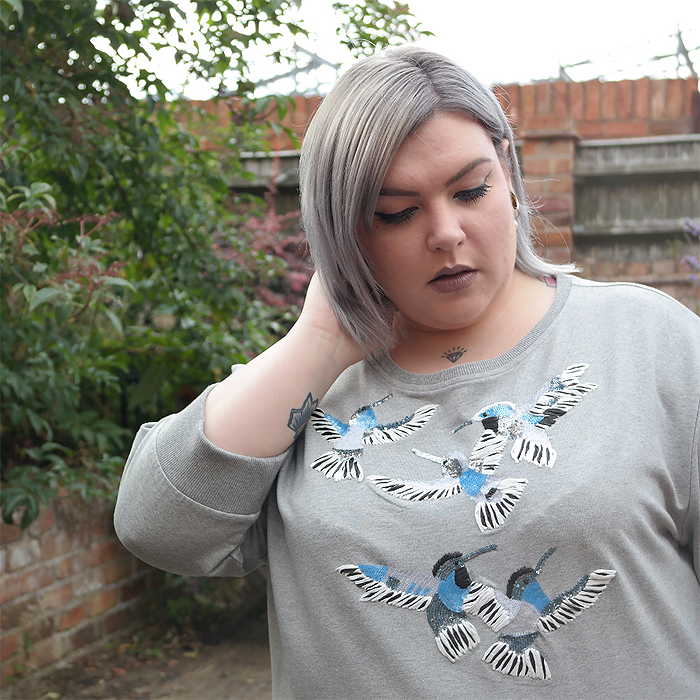 You may have noticed my hair being a bit more silver at Style XL which was just after we did a test dye at a lighter shade to make sure I did like the grey and now we've gone the whole hog and got this gorgeous shade. I'm so thrilled with it you have no idea! I've had another session with Emma Kierzek at Aurora Tattoo Studio in Lancaster and now my portrait of Sean Young in Blade Runner is nearly complete with more detail and a lovely purple fade added to the background! It's so incredible, Emma is just amazing and I can't wait to show you all in more detail when she's all finished. There are only a few people in the world that I would consider getting a portrait piece from and I count myself very lucky that I had the change to get tattooed by Emma. I've changed roles at work and now I run the e-commerce department which I'm enjoying a lot more than my last few jobs. I get to run the whole thing from start to finish and manage my own time which is great and my knowledge of marketing and social media that I have gained through blogging comes in really handy. My dream is to one day work for myself perhaps running my own shop or illustrating or blogging full time - something creative basically - so I have never really felt a true love for any of my full time jobs but lets just say that this one is far more tolerable than my others have been!!! I have a lot coming up over the next few months which is very exciting - I think life is so much more pleasant when you have things to look forward to! In a few weeks we're spending a weekend in London when I'm attending Modern Calligraphy 101, a workshop held by Lamplighter London which I'm very excited about. I'm completely new to calligraphy using pen and ink so I hope I'm good at it! Pete and I will also be heading to Somerset House in the evening to attend a Film4 Summer Screen - our tickets were a wedding present from some lovely friends who are coming with us, yay! On the Saturday we have a free day in London so I think we'll just meet up with some friends and have a nice wander and a meal somewhere. Lots of fun! I have a few photo shoots over the next few months that I'm really excited about but unfortunately I can't reveal anything about just yet - so sorry to be infuriatingly vague! September looks like it's turning into another fun month - we have tickets for Florence and The Machine at Nottingham Arena and it's the Curve Fashion Festival in Manchester at the end of the month. At the start of October it's my birthday and we're planning another weekend down south! We're going to finally go to the Harry Potter Studio Tour and then head into the capital for a fancy dinner, then the next day we're off to Pete and I's favourite place in England the V&A to go to the Shoes: Pleasure and Pain exhibition. In November it's the British Plus Size Awards and then we're on the festive count down hooray! I've added to my collection of Kat Von D's Everlasting Liquid Lipsticks with three new shades - I still have 23 more to get before I have the full set but I adore the ones I have. It's such a fantastic formula and the packaging and quality of the does foot applicator are tremendous, not to mention the amazing colour range! I grabbed two sale pieces from Evans' Design Collective range and they're both lovely. 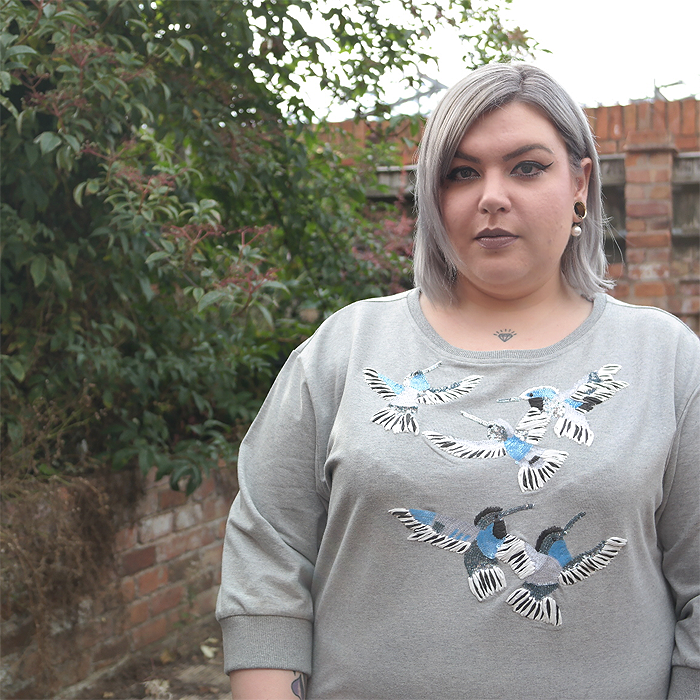 First up is the Grey Embellished Jumper which is on sale for £15 and then the Ivory Devore Skirt which is now a bargain at £20. 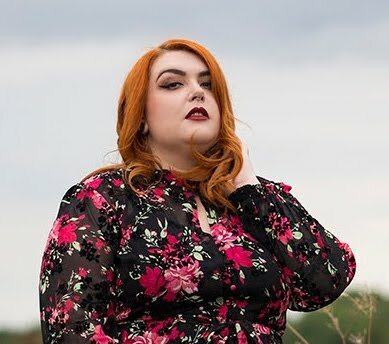 They both fit like a dream and you can't beat a luxurious feeling piece of clothing, not something you come across that often in plus sizes and especially not at these prices! I've been making sure I don't spend all my evenings working away in my office and have some nice chilled out times with Pete and Cleo getting cosy and watching TV. Our favourites right now are Brooklyn Nine-Nine, Bob's Burgers, Miss Fisher's Murder Mysteries and re-watching Parks and Recreation which will forever be our favourite! Pete and I are planning a trip for our anniversary next May, a sort of second honeymoon if you will and I just love planning holidays - it never fails to perk up my mood! Well, that's what's going on with me rightt now - do you have any exciting plans or news to share too?